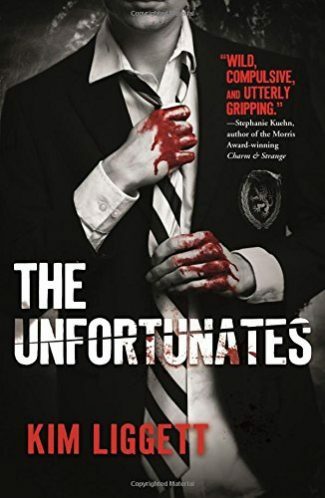 The Unfortunates by Bram Stoker Award-winner Kim Liggett is a haunting tale of privilege, guilt, and redemption, perfect for fans of Riverdale and Pretty Little Liars. Some of my favorite crime fiction tales are ones of redemption, where characters try to atone for the blood on their hands or a lifetime of bad choices. That path to atonement is often blocked by powerful people, but what happens when it’s your own family that’s standing in your way? That’s the question that kicks off Kim Liggett’s new YA novel, The Unfortunates, which combines a crime fiction-style set up with the setting and stygian terrors of my favorite horror movie, The Descent. The result is a fun, thrilling, and powerful combination. The central character of The Unfortunates is Grant Tavish V, and when we meet him, he’s haunted by what his life has become. Grant is the teenage son of a very powerful senator whose life was turned upside down by a drunk driving incident on a dark winter night—an incident that left him with blood on his hands. He hates himself for what he did and for the fact that, thanks to his father’s wealth and political clout, he’s about to get away with it. After the “incident,” when my mother came to the hospital, her eyes full of tears, she leaned over and hugged me. I couldn’t remember the last time that happened. I wrapped my arms around her and wept like a baby. All I needed in that moment was to feel loved … to feel safe … to be forgiven. Not I’m glad that you’re okay. Liggett spends the initial portion of The Unfortunates introducing us to Grant, his family, and the other characters that are a part of his noirish and nuanced world. Through Grant’s first-person narration, we learn that the people he interacts with aren’t necessarily all bad, but they’re raised to believe they are governed by a different set of mores due to their wealth and power. This sets the tone immediately, effectively showing how cold Grant’s world has become and how isolated he feels by his guilt. It makes him a protagonist you can empathize with and root for. You want him to be given the chance to atone, but you also understand why he sets out into the nearby woods and caverns to break away from his family and life. Grant’s plan to escape his family takes a turn for the worse when a sudden cave-in occurs and he’s trapped underground in the caverns. And yet, for the violence that just occurred, it’s eerily quiet. Like any hope of the outside world has been blotted out along with the sun. The only sounds I hear are a sporadic drip, rope scraping against the metal clamp, an occasional breeze wheezing through the cracks in the rock. Or maybe it’s a whisper. Even down here I can’t escape the feeling like there’s someone with me. Watching. It’s that same feeling you get when you rush down a dark stairwell, like something’s right over your shoulder … breathing down your neck. It’s in this portion of the novel that Liggett deftly moves from the morally murky world of the rich and powerful to a world of pure horror. Earlier, I mentioned that the book reminded me of my favorite horror movie, The Descent, but it’s not just because a large portion of that movie also takes place underground. Like The Descent, The Unfortunates takes a slow-burn approach to horror. You’re allowed to get to know the book’s characters and immerse yourself in the atramentous underworld they’re trapped in. Shortly after the cave-in, Liggett introduces you to the other cast members of The Unfortunates, a group of friends from a nearby public school on a cave outing who got separated from their peers and trapped underground as well. As the experienced caver, they look to Grant for help, and he might just earn his chance for some atonement. They’re a fun and fascinating group that includes Kit, a street-savvy kid with a head for numbers; Darryl, a large teenager with an even larger heart who aspires to serve his country as a marine; his girlfriend, Maria, who has turned shocking encounters with death and violence into a reverence for all life; and Shy, an Olympic hopeful who catches Grant’s eye early on. Those kids all have fully fleshed out backstories, and some of the most enjoyable and poignant parts of The Unfortunates come from Grant getting to know the motley crew. They hail from a world outside his own, which makes Grant appreciate them even more. His guilt, of course, makes him feel like he doesn’t deserve their friendship, but as a reader, I desperately wanted Grant to tell them the truth about himself and maybe find some of the acceptance he desperately craves. I think about my friends up top, people I’ve known my entire life. I’ve never felt as close to any of them as I feel to Shy, Kit, Maria, and Darryl. Maybe it’s just the stress of going through something like this, but I hope it’s something more. The thing is, we all have problems. Some have loving families, some have none. I’m rich and Kit’s as poor as you can get. But we all want out—not just out of this cave but out of our circumstances. We all want to be better than we are. But then I think about who I really am. What I’ve done. A chill rushes over me. Who am I kidding? They would never be friends with me if they knew the truth. Passages like the one above are even more emotionally resonant because, as I mentioned, The Unfortunates is a horror novel, and Liggett doesn’t let you forget it. There’s a great sense of creeping dread throughout the book as Grant and the other kids trek across the underworld. Eventually that dread climaxes into some powerful, heartbreaking, and horrific reveals as you learn the truth of what happened to Grant on the night he drove drunk as well as the sinister force lurking in the shadows waiting for the right moment to strike at Grant and the other teens. The Unfortunates is a very effective mix of redemption and slow-burn horror. It’s the first book I’ve read by Kim Liggett, and I’m definitely eager to try out some of her other work. Read an excerpt from The Unfortunates!